Preheat oven to 400°F. Place wire rack on rimmed baking sheet. 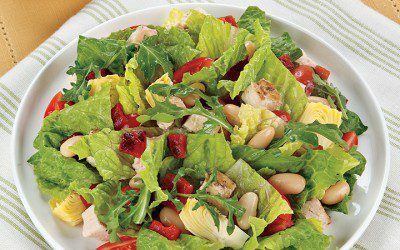 Combine lettuce, arugula, tomatoes, artichoke hearts, roasted peppers, beans, and remaining chicken in large serving bowl. Serve with dressing. Combine garlic, basil, vinegar, and red pepper flakes in small bowl. Carefully spread half of garlic mixture under skin of each chicken breast. Place chicken on wire rack. Roast 45 minutes or until no longer pink in center. Remove skin; let stand until cool enough to handle. Chop chicken; reserve 1/2 cup for Chicken Caprese Panini or another use. Exchanges per serving: 3 Vegetable, 3 Meat.